The Chairman and Executive Director, Dr. H.A.S. 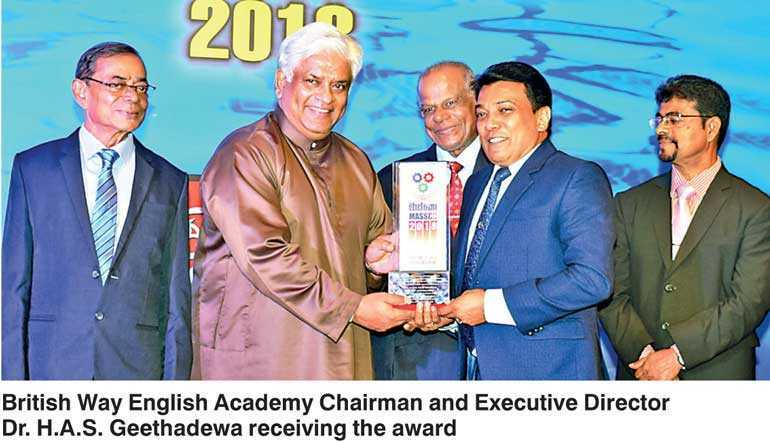 Geethadewa of British Way English Academy, one of the premier English language education institutions in Sri Lanka, was recently awarded the MASSCO 2018 award for business excellence. The awards ceremony, with Minister Arjuna Ranatunga as Chief Guest, was held with much grandeur at the Ramada Hotel in Colombo. This awards ceremony is held annually to recognise institutions and individuals, who have rendered a great service in various ways to the motherland and the betterment of our people. The Academy which started with seven students in 2004 today provides an English education to approximately 25,000 students. The main aim of the British Way English Academy is to help students master the English language which will help them to achieve the relevant goals in their respective careers and in doing so improve their confidence and strength to overcome any obstacle. British Way English Academy achieves this aim through an extremely qualified panel of teachers who have undergone both national and international training. The Academy which has a network of branches in 16 cities around the island has also entered into partnerships with several international universities. British Way English Academy also conducts a seven month residential education camp for students who have scored low in their A/L and O/L exams. Thames College and British Campus are affiliated institutions of British Way English Academy. The Academy which has won many accolades, both nationally and internationally, works on the premise that there is no such goal that is impossible and that everything is achievable. Thus they have won several awards for their contribution towards the development of the English language in the country.